In this study, we propose an effective cooperative carrying method for mobile robots in an unknown environment. During the carrying process, the state manager (SM) switches between wall-following carrying (WFC) and toward-goal carrying (TGC) to avoid obstacles and prevent the objects from dropping. An interval type-2 recurrent fuzzy cerebellar model articulation controller (IT2RFCMAC) based on dynamic group differential evolution (DGDE) is proposed for implementing the WFC and TGC of mobile robots. 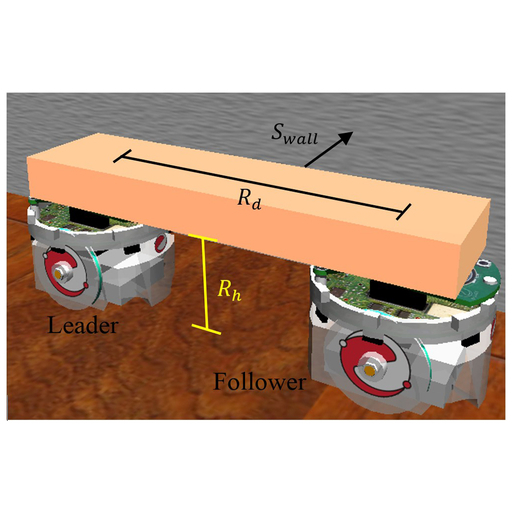 The adaptive wall-following control is developed using the reinforcement learning strategy to realize cooperative carrying control for mobile robots. The experimental results indicated that the proposed DGDE is superior to other algorithms and can complete the cooperative carrying of mobile robots to reach the goal location. Jyun-Yu Jhang, Cheng-Jian Lin, Tzu-Chao Lin, Chao-Chun Chen, and Kuu-Young Young, Using Interval Type-2 Recurrent Fuzzy Cerebellar Model Articulation Controller Based on Improved Differential Evolution for Cooperative Carrying Control of Mobile Robots, Sens. Mater., Vol. 30, No. 11, 2018, p. 2499-2516.